See what happens when I moved down here to the world’s best bread basket? All of a sudden, I have an interest in a few little projects, like growing persimmons, making sour plum alcohol, and maybe a few other “top secret” projects. 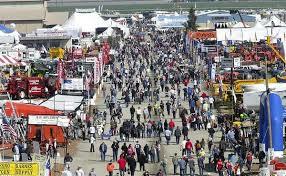 As a result, my brother and I are going to the 48th World Ag Expo in Tulare. But don’t expect me to start raising free range chickens, or an orchard full of exotic peaches. This is BIG deal around here. Upwards of 100,000 Valley farmers and other interested parties will attend the Expo. And anywhere from 160+ acres of exhibits, numbering about 1400, will be on display. A total of 2.6 million square feet of exhibit space far surpasses any type of convention, auto show, or county and state fair that I have attended. 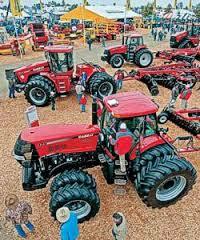 Maybe I can find my supercharged tractor, with enclosed cab, GPS, stereo, TV, and AC. Even my old friend, Governor Jerry Brown attended last year’s Expo. Many speakers and forums are held concomitantly, with the Water Forum at the top of most attendee’s list. Another popular event is the Top Ten New Products competition. Companies can submit new products, which are judged by a committee of professional judges. Of particular interest to me is the Wine and Cheese Pavilion. Am I too small to export? Is the risk too high? Hear success stories from a small business owner who has used government export programs to establish a global presence! Meet a panel of key trade representatives who can answer all of your questions and provide resources to make your company competitive. Learn how to use federal programs to find new customers, leverage capital and financing, and unlock sales opportunities worldwide. Other seminars will focus on GMO labeling, competing in a global market, drip irrigation, dairy herd management via the cloud, new trade partnerships, water deficit, crime prevention, market risk, regulatory updates, Valley fever, genomics, feeding the world, tax laws, beneficial microorganisms, benchmarking reproduction, groundwater pump efficiency, product recalls and outbreaks, new pump technology, I think you get the idea there is more to farming than any of us in the city realize. Attendees will come from 48 of our fifty states, and from upwards of fifty foreign countries. This three day event is held in the city of Tulare, about halfway between Fresno and Bakersfield. The first show in 1968 had 157 exhibitors and 28,000 attendees. Technology to increase the efficiency of irrigation is perhaps the hottest topic given the state’s drought condition. Other areas likely to draw interest are labor saving tools, alternative energy sources, and get this, the use of drones! I can see having a drone with a camera to monitor work crews, irrigation status, and even select spraying, pollination, and fertilizing of crops. My brother says the food booths are really good here, which is something you might expect in the fresh food capital of the world. Thirty three food and beverage booths will be sponsored by various youth groups who use the Expo as a big fund raising event. He says the steak sandwich and peach cobbler are the best food here. Now, where was I? Oh yes, the Ag Expo in Tulare. This is a really big deal down here. Farming is the backbone of the economy. And most everyone is dependent on agriculture directly or indirectly. If we do not find our way out of this drought, it will be bad news here. But it will be worse for city slickers trying to find food. We can grow a vegetable garden, and buy a 50 or 100 pound sack of rice to survive on. You? ← Been Here, Done Aloha?